The devil makes work for idle hands, as the saying goes, so if you have children, beware the school holidays! From state-of-the-art laptops knocked off tables to spillages on expensive new carpets, the ‘little angels’ are notorious for causing costly damage around the house. 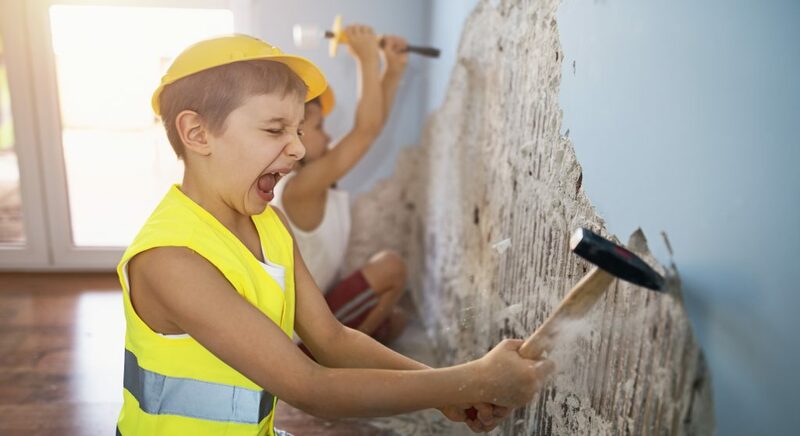 Annoyingly for parents, the havoc they often wreak is so common that most standard home insurance policies won’t pay out for putting any ‘little accidents’ right. For that, you need to contact your insurer and add cover for accidental damage. However, claiming on insurance usually means an increase in premiums, as well as the loss of any no claims bonus you may have carefully built up. So it’s best to prevent ‘idle hands’ in the first place. Here are some great ideas for keeping children occupied during the holidays, without spending a fortune. Easter egg hunt – It goes without saying, but holding an Easter egg hunt can keep children amused for hours. Even if you don’t have much outside space, try and find a local park or wood to hold it in. Easter bunny sock puppet – In the build up to the egg hunt, use old socks to make an Easter ‘bunny’ for each child. You could use buttons and cut out bits of coloured paper for ears and noses, and they’ll love their bunny, at least for the Easter weekend. Egg racing – Using straws and mini-eggs of the tiny variety, set up an obstacle course on the floor or a large table and have the children blow the eggs towards the finish line. Real egg decorations – Blow some eggs in the normal way (make a small hole at either end and blow into a bowl to save for cooking), then let the kids imaginations run riot with paint and felt-tip pens. You could hold a competition for the best in various categories, making sure each child is a winner of course! Making dens – If the weathers up to it, children love nothing better than making a den in the garden. You could use old chairs, duvets, blankets, plastic bags and umbrellas. Encourage the kids to then take their favourite toys and books etc. in and you might not see them again for hours! If the weather’s bad, just get them to do it inside somewhere they can’t cause too much damage. Wildlife safari – Head out into the countryside or a local decent-sized park and ‘hunt’ for signs of bugs, birds, foxes, ducks, and whatever animal-life you can find. Keep ‘evidence’ such as fur, feathers or creepy-crawlies in jars and ‘catalogue’ it later at home in a scrap book. Crayon cooking – Kids simply love you helping them melt down old wax crayons, watching the colours melt and look a bit magical. One idea is to make ‘crayon cakes’ by placing the crayons in cupcake casings or old oven dishes inside the oven. Once melted, they’ll have amazing rainbow ‘dishes’ to smash up or draw with. Movie-making – There are plenty of things you can get kids to film and then easily edit with later. Get them to make a movie, either putting a simple story together or simply filming their morning, then put it together later and having a ‘premier’ that afternoon or night.